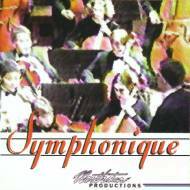 Symphonique is a CD-ROM for the Akai S1000 and compatible samplers. It incorporates 55 banks of digital instrumentation from the modern orchestra. Pitched solo and ensemble instruments are the focus (Percussion is highlighted in the new, separate "Orchestra Percussion" CD-ROM). This is the hot arranger's toolkit. Medium and large section strings abound, including string runs. Detailed multi-sampled solo string, brass and woodwind instruments provide unparalleled realism. Solo violin samples include accurately timed phrases, patterns and runs for performance sampling. In addition a 16 megabyte, 7 foot Bosendorfer grand piano and 16 megabyte, full manual 8 foot harpsichord complement the disk. Wonderful vocal ensembles round out the bank selection. This is a must-have CD-ROM for symphonic sequencing. The retail price is $249. Click Purchase This Title, or contact Northstar for complete information and shipping details. Northstar accepts VISA/Mastercard/Amex/Discover, check or money order. (503) 760-7777.